Hillary Clinton’s visit to India this week may well be her last as secretary of state, with Clinton set to step down regardless of whether Barack Obama wins reelection in November. Such a trip therefore assumes a special significance, and Clinton generally did well in ensuring that the visit was free of any diplomatic glitches that could prove costly in the long run. Still, there were some issues of contention. Clinton began her trip in Kolkata, where media reports suggested that she discussed the Teesta waters issues and foreign direct investment with West Bengal Chief Minister Mamata Banerjee. However, Banerjee told reporters after the talks that actually, she didn’t discuss the Teesta issue or FDI. Moving on to the New Delhi leg of her India trip, Clinton held separate talks with Prime Minister Manmohan Singh, her Indian counterpart S.M. Krishna and United Progressive Alliance chairperson Sonia Gandhi. There, Clinton discussed the question of terrorism emanating from Pakistan, and was candid in arguing that Pakistan wasn’t doing enough to eradicate terror sanctuaries. 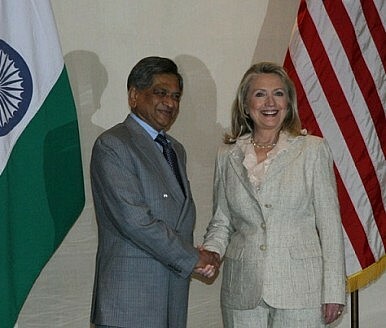 At their joint press conference, both Clinton and Krishna increased pressure on Pakistan to take steps against the perpetrators of the November 2008 Mumbai terror attacks. Indeed, Clinton didn’t mince her words, explaining the United States had reason to believe that Lashkar-e-Taiba founder and Jamaat-ud Dawa chief Hafiz Saeed was one of the principal architects of the 26/11 attacks. Meanwhile, India is also reducing its dependence on Iranian oil, which should be music to American ears. India’s oil imports from Iran now account for about 9 percent of the total, compared with 12 percent several months ago. Clinton welcomed Indian steps in this direction and said India must step up pressure on Tehran. On the flip side, some glaring issues remained unresolved. From the Indian perspective, the U.S. visa regime for Indian professionals continues to be “protectionist.” From Washington’s standpoint, India is unrelenting on sticking points concerning full implementation of the Indo-U.S. nuclear deal. Krishna for his part said that he raised the visa issue with Clinton. “I did convey our concerns about the continuing difficulties on mobility of professionals, especially for our IT companies, and protectionist sentiments in the U.S. with regard to global supply chain in services industry,” he said. Hillary Clinton upsets India’s opposition after putting pressure on India to change its nuclear liability laws.